Although officially only a ‘day trip’ a dozen or so club members had made their way over to Cobnor on the Saturday for some ‘peer’ paddling and a nights camping. 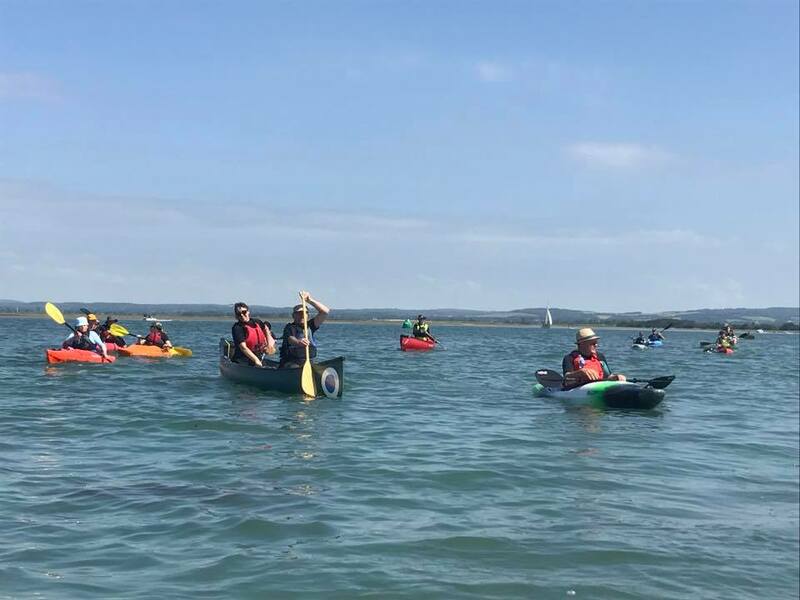 The peer paddling involved a trip for some kayaks and SUPs from Cobnor as far as the Anchor Bleu in Bosham in the glorious weather that trip supremo John Kennett had arranged. Sunday was the day for the trip proper and by 10am there was a flotilla of about 20 (Canoes, kayaks, sea-kayaks and a dog!) ready to set off for East Head at the Witterings. The weather was still glorious and it was a lovely paddle down with an increasing volume of (much) larger boats also making their way to open waters. Having made good time to East Head we decided to paddle around to West Wittering beach in search of ice-cream. The fab weather meant that the beach was *very* busy – the police closed the road later – but paddling to it meant that we were able to find a quite spot and avoid most of the crowds. We pootled about here for an hour or so and when the lifeguards on their assorted quad-bikes, jet skis, jeeps and RIBs started telling people to make their way back from the sand island we knew that the tide was turning and we could have a leisurely paddle back. We made another stop at East Head just to visit the ice-cream boat – it would have been bad form not to – and some of our group apparently also stopped alongside a moored craft to share cold beverages with some yachties who were obviously up for a bit of hanging out with the common people! The trip back was very pleasant and all those involved in the water fights were willing participants. How two very competent canoe paddlers ended up in the water – unaided by anyone else – is still something of a mystery but pictures were taken so we have some early ‘SOTY’ candidates. We were off the water by 4pm and by virtue of being in Cobnor managed to avoid what would have no doubt been horrendous traffic queues to get away from the Witterings. All told it was another really good ACC trip with a lovely mix of paddling and socialising.